KATE McCANN TTN. 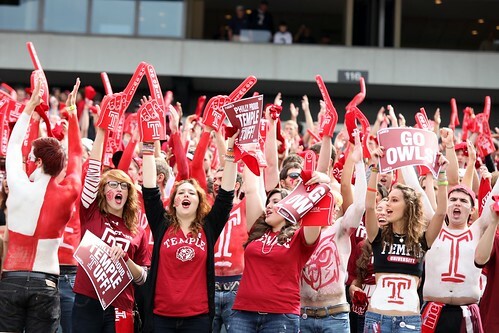 Temple students filled the Lincoln Financial Field on Saturday, Sept. 17 for the football game against Penn State. While the game drew in the highest student attendance in university history, student fans’ shirts sporting vulgar phrases have become the subject of complaints to the university. The university received numerous complaints about T-shirts sported by students at Saturday’s football game. While some students at the football game against Penn State on Saturday, Sept. 17, basked in outrage and general upset after Temple’s loss, others took issue with the T-shirts worn by fans in the audience. A number of complaints were sent to the university in relation to the high visibility of T-shirts worn at the game that included vulgar remarks. Similar shirts received critical attention at the Sept. 8 Villanova game, as well. At yesterday’s Temple Student Government General Assembly meeting, Student Body President Colin Saltry addressed the T-shirts and expressed disappointment in the students who chose to wear them. “They created an environment of intimidation,” Saltry read from one complaint emailed to President Ann Weaver Hart’s office. “I am a Penn State alumni who looked forward to the game until I had to walk with my grandson past those students,” Saltry read from another. An alumnus said in a complaint that he would not provide any funds for scholarships for Temple, after seeing the shirts, Saltry said. Crossley, a sophomore management information sciences major, said the sale was a part of an ongoing T-shirt fundraiser by his fraternity, Phi Kappa Theta. PKT sold about 700 shirts in about four hours, Crossley said. Crossley also confirmed that his fraternity sold T-shirts for the Sept. 8 football game against Villanova. In addition, he said the brothers also sold shirts for St. Patrick’s Day and Spring Fling last year. “It’s the easiest way to make money, the fastest too,” Crossley said. Crossley said proceeds benefit the fraternity and its philanthropy efforts. He added that it is considering selling shirts during Breast Cancer Awareness month and donating 25 percent of the proceeds toward the cause. As fraternities and sororities prepare to take on new pledges, the T-shirts have also helped draw attention to PKT. Crossley said a father of one of the brothers works for a screen printing company, which helps their makeshift business. Stephanie Ives, dean of students and associate vice president for student affairs, confirmed that her office received email complaints and issued a statement to The Temple News regarding the situation. “I have confidence that from this point forward, our students will engage in an extraordinary show of school spirit that will be characterized by civility and respect,” Ives statement reads. Ives did not elaborate on how the university deals with these complaints. The university Student Code of Conduct prohibits “any lewd or indecent act, including public urination, which the student knows is likely to be observed by others.” Yet, the Code does not specifically prohibit students from wearing potentially offensive clothing to university-sponsored events. In recent weeks, West Virginia University requested its student football fans retire similar shirts that contained a curse word. Freshman English major Anastas Duka said the shirt gives confidence to fans at the football games. This isn’t the first time Temple students’ T-shirt businesses have been the subject of university scrutiny. Last spring, after The Temple News featured Greg Gant’s T-shirts, known for his “Thug Life,” designs that utilized Temple’s trademark “T,” the university issued a cease-and-desist notice to the now-alumnus. Crossley said he isn’t concerned about receiving such notices because his fraternity is careful to stray away from using university marks on its products. The owl used on the shirts sold for the game against Penn State was an image found through Google, Crossley said. “That was not Hooter,” he said. Angelo Fichera and Alexis Sachdev can be reached at news@temple-news.com. It was 4 p.m. on the corner of Broad and Chestnut streets. The streets were alive with people – constant streams hurrying past in all directions. Above the cars’ honking and crosswalk beeps, a steady pulse could be heard. A few people noticed its source. Others subconsciously walked in time with it, but most ignored it, allowing the music to fade into the soundtrack of the city. After he was offended by T-shirts with the words “Cheers B—-es,” on them, Josh Fernandez decided to investigate the origins of this loaded word. “If you’re offended, look away” This is the kind of thinking that gets the student section a terrible reputation. Aside from the vulgar t-shirts, the chants and language that I heard in the student section made me ashamed to be a Temple student. The success of the University’s athletic teams has been great for everyone, but as we garner more national attention and TV coverage these actions by the student section only serve to show others that we aren’t ready to be in the spotlight. Being loud in support of the team is the goal so lets focus on cheering for Temple and not booing the other team. Instead of complaining about the t-shirts, why don’t you write about a topic that’s relevant, such as the 100’s of fights that broke out in the game/parking lots or how disrespectful fans were trashing the parking lots from their drunken tailgates? If a t-shirt makes or breaks the experience you had at a football game, there’s something wrong with you. Or – you could write about all the community service these organizations are doing and how they are all self-funded. These organizations need money to run and students loved these shirts. The article shows yes that there is an issue with the shirts but this again is temple news just digging for a story. My reasoning for this is these two guys are NOT in kdr. As a KDR member it disgusts me that the Temple News would post something like this and not even check the IFC brother listing to confirm there source. Do us all a favor and confirm your source like a real paper does before you post more gossip like its the tech center stall walls. Fraternities are so pathetic. If you want to put a stop to these immature punks, just instruct security to refuse them admittance to the stadium if they’re wearing vulgar, obscence, etc. clothing. @ Tom, Fraternity men are the ones getting the jobs and have a higher GPA than the rest of the student population. Get educated. Why doesn’t this article mention the “Go F### Yourself State College” shirt that was created for personal profit rather than support to a student organization? temple football is still a Philadelphia sporting event, Saltry should be happy no one vomited on his grand kids or threw old batteries at them. I say they are still upset that they didn’t get into Penn State! This past weekend my parents came up to visit TU for the first time. I’m a transfer student and I was really excited to show them around. Unfortunately, the timing of their arrival coincided with the Villanova game and their experience took a turn for the worse. We past hordes of drunk temple students shouting obscenities, many of them wearing the aforementioned T-shirts. Hey – I’m as progressive if not even more so than the next guy, but most of you can relate to how traditional/judgmental parents can be. My dad wasn’t upset but he seemed really disappointed that these same drunken buffoons are my soon to be classmates and peers and I think a little part of me agrees with him.